Born in 1963, Bernard Cohen is the author of The Antibiography of Robert F. Menzies (2013), Hardly Beach Weather (2002), Snowdome (1998), The Blindman's Hat (1997) and Tourism (1992). His children's picture book, Paul Needs Specs (illustrated by Geoff Kelly), was published in Australia and New Zealand (1993), US (2004) and Korea (2010). Bernard won the Australian/Vogel Award in 1996 for The Blindman's Hat, was named as one of the Sydney Morning Herald's Best Young Australian Novelists in 1997, 1998 and 1999, and won a 2001 Arts Council of England Writer's Award. He was University of Technology, Sydney alumnus of the year and also holds a Doctorate in Creative Arts from that joint. Since winning the young writers' section of the Canberra Times short story comp in 1986, Bernard's stories and articles have appeared in dozens of anthologies, newspapers, magazines and literary journals around the world, including The Penguin Century of Australian Stories, Best Australian Stories, Best Australian Essays, Harvard Review, Times Educational Supplement and most of the major Australian litmags. Other writing projects include Speedfactory, a collaborative book with John Kinsella, McKenzie Wark and Terri-ann White, published by Fremantle Arts Centre Press in August 2002 and the installation CD ROM Foreign Logics with artist David Bickerstaff – Foreign Logics was the Institute of Contemporary Art (London) multimedia work of the month in September 2001 and was exhibited around the UK. Bernard lived in the UK from 1999–2002, undertaking a bunch of residencies and collaborative writing projects including at Peckham Library in south London, where he worked predominantly with young Afro-Caribbean Britons, University College Worcester and Nottingham Trent University. In 2002, He was writer-in-residence at Sir John Soane's Museum (London), where he established the Fictional Soane website and ran workshops for school children. Back in Australia, Bernard founded The Writing Workshop in 2006. Since then he has worked with over 30,000 young people. 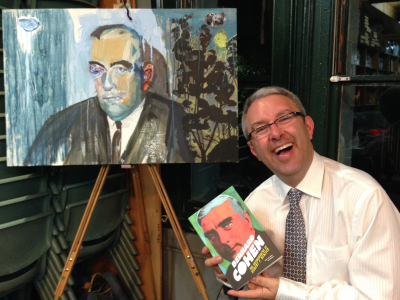 In June 2015, Bernard’s best-selling antibiography The Antibiography of Robert F. Menzies won the inaugural Russell Prize for Humour Writing, the only award for humour writing in Australia and one of few in the world.